Many days here on this mountainside, we also find ourselves cloud-hidden, surrounded by fog so dense that our whereabouts might be unknown even to ourselves were it not for familiar landmarks identifying the place. People tend to think of fog and clouds as different entities. 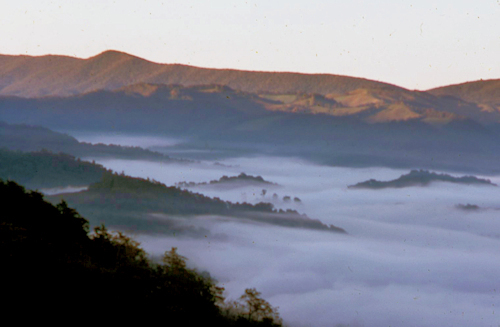 Fog is found at ground level while clouds are high overhead in the sky. Yet here in the mountains we have frequent opportunities to see that they are the same thing; it’s just a matter of location (or more accurately, elevation) that makes them different. Most of the time we might indeed see the clouds high above, moving across the sky ahead of the winds. Other times they seem anchored to the tops of the mountains, sometimes not appearing to move for days. Travel higher up the mountain though and it is soon evident that the cloud and the fog are the same; the drop in visibility makes it obvious. The mountain beyond the trees has disappeared in the fog. On other days here at home the sky is clear and blue with not a cloud to be seen anywhere. On such days we can see for miles. But travel less than half a mile to a place from which we can see the nearby valley and we see a solid mass of clouds 2,000 feet below. The people there are locked in dense fog, the bases of the mountains are hidden, the tops of the mountains rise into the clear air above those low-lying clouds. Observing clouds in the sky above can be endlessly fascinating with their myriad types and constantly changing shapes. Looking down into the valley and seeing the familiar mountain landscape transformed by the carpet of clouds brings forth gasps of wonder no matter how often the sight has been seen before. Being in the fog, actually inside a cloud, also gives rise to different feelings. There is a sense of mystery. Perhaps being deprived of the abundance of visual stimuli which usually surrounds us, enhances the remaining sensations. 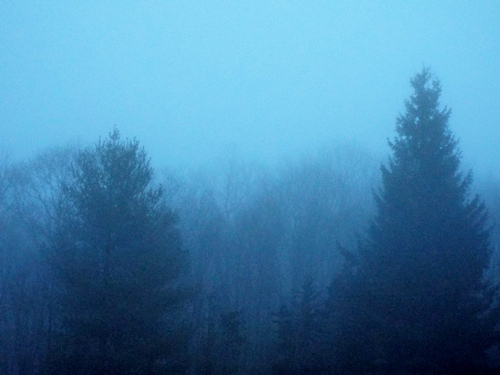 Walking through the meadow or the woods when fog limits visibility to ten feet or less focuses attention onto a smaller world. The budding branch of a favorite wild azalea comes slowly into view. A bit farther on, a familiar rock helps me place myself in my surroundings. The spring peepers calling from the bog along the creek, a clump of daisies passed a few days ago, the oddly bent limb from the ice storm last winter, the scent of honeysuckle growing on the bank at the side of our road, the change in the slope of the ground, all give clues to where I am at this moment. All stir memories of the times I noticed these small things before. They make me glad that I did notice them. Sometimes we need help to be able to focus, to pay attention to what really matters. Perhaps that’s why the zen master went walking on the mountainside. Maybe when the cloud blocks out that which appears to us most easily, we are then able to see other things more clearly. Thanks be for the fog.